This free standing enclosure allows you to take your chickens anywhere so they can friendly range within the grass while staying protected and accounted for. 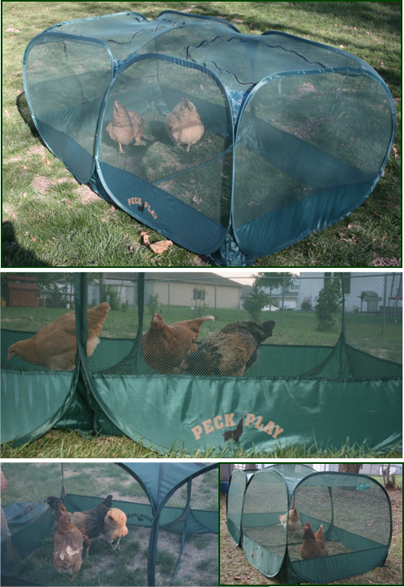 This is a great solution to keep your chickens in while cleaning their existing coop as well. Large mesh side walls offer panoramic views to the outside while letting you keep an inside view of your girls. Vertical side walls increase space inside for a massive 17 square foot roam area. The dimensions when set up are 68" long x 36" wide x 31" tall. The use of flexible, yet sturdy structured support beams offers a combination of space and stability in a very light weight design. Fastens securely to the ground with six metal stakes. A compact carry bag allows for quick and easy carry with a small folded down dimension of only 15" x 15". Two top access zipper entries all you to quickly put in and take out your chickens! This is one of the easiest chicken enclosures to use on the market today! how many full grown chickens can fit comfortably? Depending on size of breeds, can hold approximately 4-6 chickens. is there a panel in the center that zips out? This looks like a terrific product! No, there is not a center that zips out. It is all one open area inside the space. Wonderful!This thing is terrific...esp for the smaller birds that I don't want to get picked on by my free ranging hens and roos. I have 6 3 month olds in it for several hours of the day. I wouldn't leave them unattended/out of earshot because we have cats that could pounce on the peck and play and do some damage. It does collapse pretty easily. Easy to set up and and easy to move. Great pen for a few birds.The peck and play is great. I especially like the webbing that doesn't let flies in. The only drawback is that the zippers eventually wear out. I still use mine, though, having safety pinned the opening shut.